This atomizer is intended for use with the vPipe II by Vapeonly. The atomizer is housed inside the Rosewood bowl of the vPipe II and is made of stainless steel. It comes pre-installed with a 1.8 ohm bottom changeable coil (BCC) and has 1ml capacity. Changing the coil and filling the vPipe II atomizer is easy. 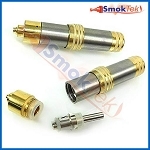 To change the coil, unscrew the base of the atomizer, pull out the old coil head and insert a new one. Screw the base back onto the atomizer. To fill the atomizer, hold it up-side-down, unscrew the base and tilt at a slight angle. Fill with e-liquid to about the top of the center tube (do not get e-liquid down the center tube, it is for airflow.) A needle-tip bottle makes re-filling effortless. Finally, screw the base back on. If using a new coil, please allow a few minutes for the e-liquid to fully saturate the coil before vaping.